Prior to October 2015, external ICD-9 coding audits were performed primarily for compliance purposes. Ongoing coding audit programs were rare due to the high cost of support and maintenance. However, following the implementation of ICD-10, many hospitals and health systems have stepped up their coding audit efforts. More frequent reviews are now recommended to measure coding accuracy—and for good reason. Coding accuracy has declined in ICD-10. A recent nationwide ICD-10 coder contest revealed scores well below the expected 95 percent accuracy rate for the second year in a row. 1 Average inpatient coder accuracy landed at 61 percent in the 2017 contest, up from only 55 percent in 2016. Why are the results so abysmal? Growing evidence suggests that traditional audit practices used during the ICD-9 era are no longer useful. Instead, the focus should shift to ongoing coder performance audits and reviews. Traditional coding audits are retrospective and episodic in nature, often times performed mainly to check the box for compliance purposes. Repeat audits of the same coder or physician and chart types are rarely performed, and coding accuracy issues are generically defined. This approach does not provide the required specificity to truly diagnose areas of coding compliance risk—and the results are not timely and actionable. Conversely, performance-based audits focus on gaining insight into the organization’s key areas of risk and opportunity through frequent intensive reviews. These audits delve deeper to identify underlying issues that cannot be revealed by a traditional audit. In addition, a more concurrent approach is used to ensure findings can be applied quickly to the coding process. There are four distinct phases for a performance-based audit: review, assess and prioritize, report, and educate. Review. This phase starts with a baseline audit, which can be a random selection of a valid sample of charts from each physician or coder. After the initial audit, the review process should be repeated with sufficient frequency—ideally a monthly rotation—to obtain adequate insight into coding errors and create an audit program that achieves continuous quality improvement. Assess and prioritize. In this phase, the areas of highest risk are identified—where coders are making the most errors. The assessment should be comprehensive, looking at all primary and secondary codes. 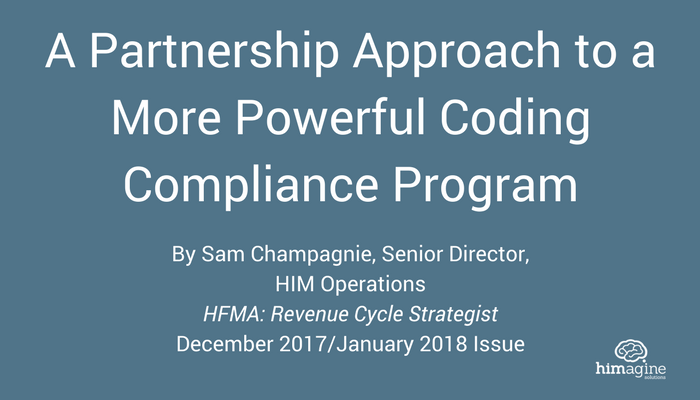 While errors that do not impact reimbursement may be revealed, it is important to consider the effect of these issues on overall coding compliance. Report. Next, assessment results are reported by issue, coder and provider. Recommendations are given for resolution of all identified issues, including specific areas of concern. This phase also includes the development of an education plan based on the findings. Educate. Education is a key component of any audit program. An effective education program will target specific areas of instruction needed by each coder or physician. Programs at the organizational level are insufficient to address hidden areas of risk by specialty, coder or provider. Many audit programs fail to achieve this level of granularity. Carla Cashio, Director of Internal Audit for DeKalb Medical Center, a not-for-profit health system in Decatur, Georgia, wanted to determine if her organization had a coding quality issue. Instead of waiting for the annual audit or payer denials, she decided the best way to measure coding quality and accuracy was to implement an ongoing performance-based coding audit program. The decision was made to partner with an outside vendor to assist in the implementation of the program due to staffing constraints and rapid start-up requirements. Begin by identifying a clear, concise goal for auditing. Create a comprehensive auditing plan that is specific to your organization and designed to address current needs. The plan should be balanced with random and focused audit samples conducted more frequently and at a deeper level of granularity. Random samples validate current performance across the board and can expose unknown areas of compliance opportunities. Focused selections are necessary for a deeper understanding of patterns of errors in high-risk areas, such as OIG targets or other specific compliance concerns. Both random and focused samples are critical to the success of a performance-based coding audit program. The one-size-fits-all model of coding audits no longer works. Coding compliance programs must evolve to meet new reimbursement requirements under ICD-10. The focus is now on ongoing, consistent improvement—understanding the baseline of current needs and building programs to advance coding accuracy over time. By identifying and ranking key areas of opportunity, and educating coders and physicians on prioritized issues, this systematic approach is a proven means to achieve optimal results from an ICD-10 coding compliance program.